The votes have been tallied and we all wait with bated breath for the big one! 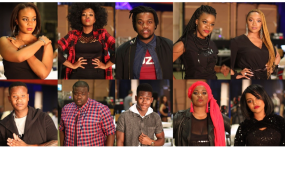 This Sunday, all eyes will be on Mzansi Magic, as we reveal which of our talent will be propelled straight into the Idols SA Top 10 by your votes. And as has come to be expected, our results show will be unlike any other. Drama is par-for-the-course and we’re keeping ProVerb's killer wit, as well our state-of-the-art stage with all its fancy trimmings. But what’s that about Judges Choice? Don’t know what we’re talking about? Have a look. * Our judges will announce the TWO they have chosen to complete the final spots in the Top 10, following intense deliberations – and what are they considering during their deliberations? Hard workers who have showed star power, stage presence and plenty of potential. Prepare for many, many surprises this Sunday, South Africa. It’s going to be an explosive show.